While I'm away in India for the next three months, I've planned to start a abecedary on Istria, to keep content flowing on this blog while I'm away. So for each letter of the Croatian alphabet (there are 30!) I'll be writing a short post about one aspect of Istria, related to its culture, geography, society, architecture, or cuisine. It's taking me a while to compile the abecedary (which is still work in progress) and I've discovered that for some letters it's more challenging to come up with something than for others. I've also been pouring through my image library looking for suitable photos to illustrate each post, or trying to source the ones I don't have. This is the name of the Roman amphitheatre located in Pula, built between 27 BC and 68 AD. 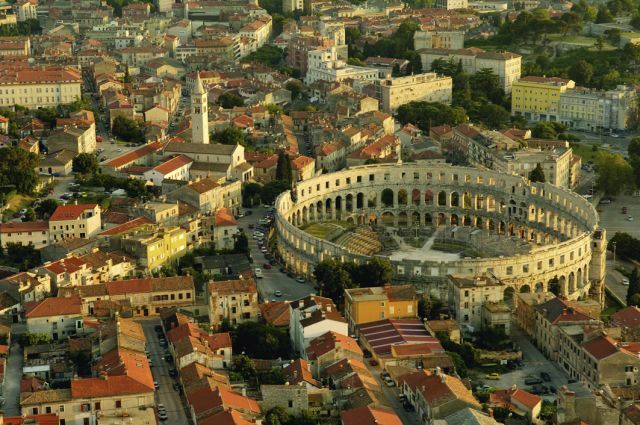 Pula's amphitheatre is considered to be one of the best preserved of the remaining Roman amphitheatres in the world because most of its outer walls are intact and it has all four side towers. Today it's a popular tourist attraction and is used as a venue for concerts and other cultural events.